Veuve Clicquot wants accomplished, influential young women to know that champagne is more than a drink reserved for wedding toasts and New Year's celebrations, but rather a bottle that, when popped, can lead to any number of surprises. "The brand vision that we have is that Veuve Clicquot is much more than the champagne. It's a brand that creates surprise," Chloe Stefani, international marketing director of Veuve Clicquot, told Adweek. 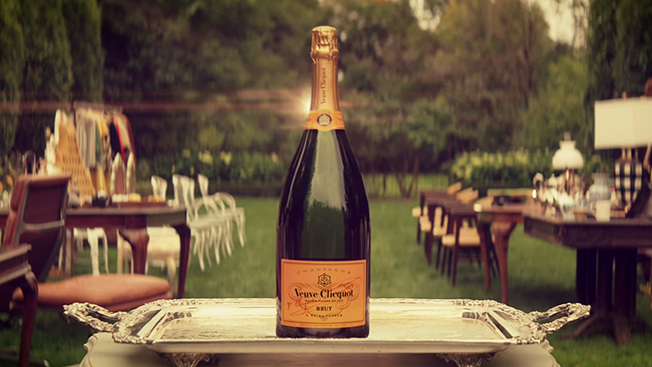 Digital-focused agency Rokkan, part of the Publicis Groupe and creative AOR for the brand, created the campaign, which includes three short films that focus on three different moments when Veuve Clicquot can come in handy—while entertaining, trying to make a good impression or negotiating an important deal. Each of the three films is inspired by an important woman from the brand's history, Barbe-Nicole Ponsardin, also known as Madame Clicquot. The spots are meant to be told from the perspective of Madame Clicquot who, in 1805 at the age of 27, took charge of the brand after her husband died unexpectedly. Over time, Madame Clicquot proved her entrepreneurial prowess and general charm, elevating the company to one of the most popular luxury brands out there. "Her story mirrors many women that we admire today, and she was doing this during a much less progressive time in history. The more people learn about the product and its origins, the more they'll understand what a wonderful and rich story there is to be told," Brian Carley, CCO at Rokkan, told Adweek. The spots are housed on the brand's Tumblr page, along with a number of charming GIFs. This marks the first time the historic brand has released a digital campaign, but considering the demographic it hopes to reach, Tumblr seemed like the perfect fit. "It was just natural for this work to live in digital, based on the targeted consumer and how people are experiencing brands today," Carley said. "The ads are lovely and could easily run on TV, but we wanted to focus on giving people a glimpse into the brand and digging deeper to discover more content across all the channels."